Read a huge range of information about local or remote computers. Also provides a way to make configuration changes to multiple remote machines. LOADORDER - System services that define execution dependencies. NETLOGIN - Network login information for a particular user. NETPROTOCOL - Protocols (and their network characteristics). NETUSE - Active network connection. NTEVENT - NT Event Log. ONBOARDDEVICE - Common adapter devices built into the motherboard. PARTITION - Partitioned areas of a physical disk. TEMPERATURE - Temperature sensor (electronic thermometer). By default an alias will return a standard LIST of information, you can also choose to GET one or more specific properties. WMIC /locale:ms_409 /alias option /? WMIC /locale:ms_409 /BIOS /CALL /? WMIC /locale:ms_409 /MEMLOGICAL /SET /? WMIC NTEVENT where "LogFile='system' and Type>'0'"
WMIC /node:@workstns.txt /failfast:on PROCESS call create "\\server\share\installer.cmd"
WMIC is available on XP Professional and Windows 2003 or later versions of Windows. e.g. ODBC, SNMP, Windows Installer. To run WMIC requires administrator rights. In Windows 2000, around 4,000 properties can be monitored, and around 40 can be configured. In Windows XP around 6,000 properties can be monitored, and around 140 can be configured. When you type WMIC for the first time in Windows 2003 all the aliases are compiled. The second, and subsequent times you run WMIC, it will start immediately. 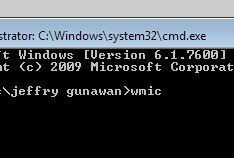 Under XP WMIC is slower to initialise, therefore to run several WMI queries it can be quicker to use interactive mode.